Buck Vantage Pro Review | Knife Informer You should know by now that I consider a pocket knife to be part of my everyday apparel; I never leave home without one. Since I’m such a frequent knife-user, I’m always on the lookout for a new design, or even a new take on a classic design. The Buck Vantage Pro is a new take on a classic, tried and true design and today I'm putting this knife through its paces. You should know by now that I consider a pocket knife to be part of my everyday apparel; I never leave home without one. Since I’m such a frequent knife-user, I’m always on the lookout for a new design, or even a new take on a classic design. The Buck Vantage Pro is a new take on a classic, tried and true design and today I’m putting this knife through its paces. Buck's Vantage series represents excellent value for money and the Pro model is the pick of the bunch. The Buck Vantage comes in two sizes (small and large) and three flavors: Select, Avid and Pro. On top of this Buck recently brought out the Vantage Force line which differ only in blade shape, blade coating, pillar or backspacer construction and different handle materials (Avid gets Aluminum and the Pro gets pure black G10 vs blue/black layered G10) and their surface finishes. Confused? You’re not alone. 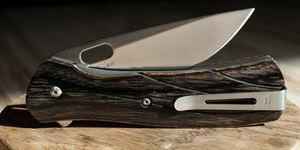 Since 1902, Buck Knives has been setting the standard for other knifemakers to follow. Buck revolutionized the knife industry in 1964 with the first folding, “lockable” knife, and Buck has been a leader in the industry ever since. The issue for many of the long-standing knife manufacturers has been keeping pace with some of the newer brands like Kershaw, Benchmade and Spyderco. These companies have introduced a variety of technology aided new designs that are taking the market by storm and forcing companies like Buck to keep up. Made in the USA, the Buck Vantage Pro is an excellent example of the leadership Buck shows in the knife world and how it is adapting to modern designs and materials. However, this knife is not without its flaws. Both the large and small Vantage models are fine as an EDC. I prefer the large myself and that is the knife I’m reviewing today. It’s a little larger than a Delica and almost as large as the Tenacious or Blur. The Buck Vantage Pro’s 3-1/4” blade comes from the factory razor-sharp. The blade is made of S30V stainless steel, a premium steel that holds an edge very well and a favorite among knife enthusiasts like myself. As I inspected the blade I was reminded that the Vantage Pro’s S30V blade is heat treated by none other than Paul Bos (who is widely recognized as one of America’s foremost heat treat authority for knife blades). I’d say it’s a little harder than most S30V blades I come across. The blade has a decent belly and is reasonably thin. With this knife, I can cut through a quadruple strand of paracord in just one swipe of the blade. Some folks find S30V a little difficult to sharpen but I sharpen my Buck Vantage Pro weekly and find that this particular knife’s partial hollow-grind design makes it very easy to sharpen, if you know what you’re doing. Personally, I find that sharpening a knife, with its rhythmic sound and actions, is an excellent relaxation exercise at the end of the week, so I don’t mind taking a bit of extra time to sharpen the Vantage Pro. This is a classic drop-point knife, which is a time-tested design, but Buck has made a few changes to the knife to make it more effective as an everyday tool. The knife features two opening mechanisms: the first, and easiest to use, is the flipper located on the back of the blade (which doubles as a finger choil). The second is an oval thumbhole, designed to allow you to flip the knife open with your thumb. Both actions work relatively well, and I can often flip the blade open so fast it seems like the knife is an automatic or assisted open knife. The locking mechanism is a liner lock, and locks up solid when the knife is fully open. There’s no play whatsoever when the knife is locked, but I noticed that some users have reported that they need to flip the knife open very hard to get it to lock. I didn’t notice that in my own review of the knife, but thought it was worth mentioning since several folks have reported the same issue. The handle of the knife features an open-pillar flow-through construction and the scales are made of machined G10 with a light texture and a few grooves for both appearances and grip. The liner is stainless steel, and the Buck Vantage Pro actually features dual liners for extra durability. The pocket clip secures to the knife with two T6 Torx screws, and holds the knife in your pocket very securely in a tip-up position. I found the pocket clip to hold the knife in place quite well, but the knife is still easy to pull when you need to remove it from your pocket and deploy it quickly. The Buck Vantage Pro only weighs about four ounces, so it doesn’t add much weight to your pocket. By way of reference it’s a little heavier than the Paramilitary 2. I’ve yet to find a truly perfect knife, and like many others the Buck Vantage Pro does have some downsides. First, there seems to be a bit of a quality control issue with the manufacture of the scales. I looked at three different Buck Vantage Pro knives at the same store, and each of them was slightly different in appearance. On one, the fit of the left scale was off, so the right scale was flush with the liner, but the left scale was not flush. On the second, the right scale was the “non-flush” scale, and the third knife had some inconsistencies with the centering of the scale. This is primarily a cosmetic issue, but when you are paying $65 or so for a knife, you do want the quality to be consistent. What’s not so cosmetic, though, is that the third knife also had the blade too flush with the liner, so that the blade rubbed against the liner when I tried to deploy the knife. Buyer beware. Both of the opening mechanisms work perfectly for my average-sized hands, but I’ve seen people with larger hands struggle slightly to deploy the Buck Vantage Pro. The flipper does not stick out quite far enough for larger hands to get a solid grip on the flipper, and the thumbhole is slightly occluded by the scale. This occlusion makes it a bit challenging for larger thumbs to fit into the oval hole and flip the knife open. Next, the lock is a bit stiff, making the knife hard to close sometimes. I read a couple of forum posts about this issue, and some users said that their knives just needed a break-in period, and the knife became easier to open over time. I’m not sure if that’s always the case with this knife, though; I tried opening and closing the knife repeatedly for at least a hundred repetitions, and noticed no difference in the stiffness. Ultimately, I contacted Buck and returned the knife for a replacement. The good news is that Buck’s customer service was very quick to send out a replacement knife, and was quite apologetic for the inconvenience. Finally there is no jimping to speak of with the Vantage. In summary, the Buck Vantage Pro is a nice knife and decent value for money, considering you get S30V stainless steel at a price much lower than most competitors’ knives. Bear in mind this knife is made in the USA too…which will please most of you. The blade holds its edge remarkably well, and the knife rides nicely in my pocket while still being readily accessible for those times when I need to deploy the knife quickly. The dual opening mechanisms are handy, since the thumbhole allows more discreet deployment for those times when you need to be a bit stealthy. Overall, this is a good knife for the price, and I would strongly recommend it as an EDC to those on a budget.